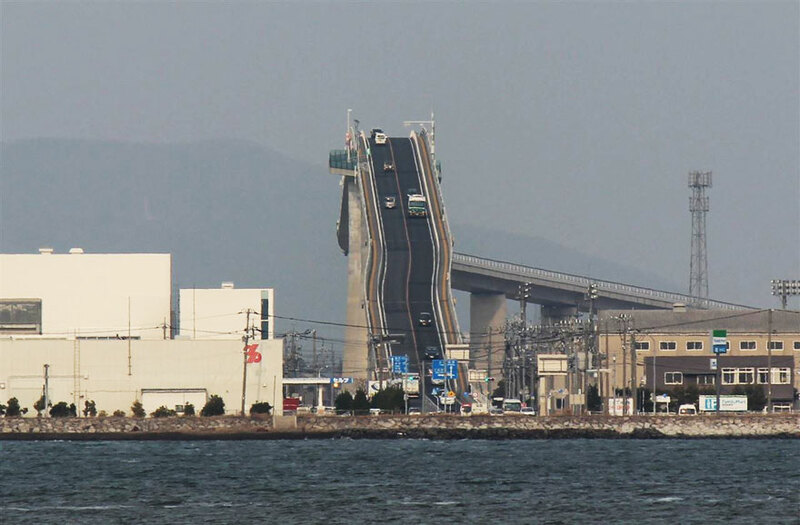 The Eshima Ohashi Bridge, located in Western Japan, looks more like a roller coaster than a road. It links the the city of Matsue in Shimane Prefecture to Sakaiminato in Tottori Prefecture and is basically a highway to outer space, a shortcut to vomiting from nausea, making driving over this thing one seriously thrilling car ride. It’s one of the most spectacular bridges in the world. The bridge is a two-lane concrete road. It rises so sharply it gives the bravest drivers the fear, featuring a ridiculously steep slope that allows ships to pass underneath it. The concrete road spans a mile and sends drivers soaring into the sky at the very sharp gradient of 6,1 per cent across Lake Nakaumi. The Eshima Ohashi bridge is 1.44 km long with a width of 11.3 meters. It is the largest rigid frame bridge in Japan. If you look straight onto the bridge , the ridiculously steep incline makes it look more like a roller coaster than a road for cars to drive on. The bridge has an insanely steep and terrifying slope that’s tall enough to let ships pass underneath it with ease. It is a stretch of road that has freaked out even the most confident drivers as it looks like an insane roller coaster. Cars gradually ascend , making it less scary for drivers than the bridge appears when photos are taken from a straight-on angle. The bridge is the largest ridge bridge in Japan , and the third largest in the world , spanning over 1 mile long and standing 144 feet high. 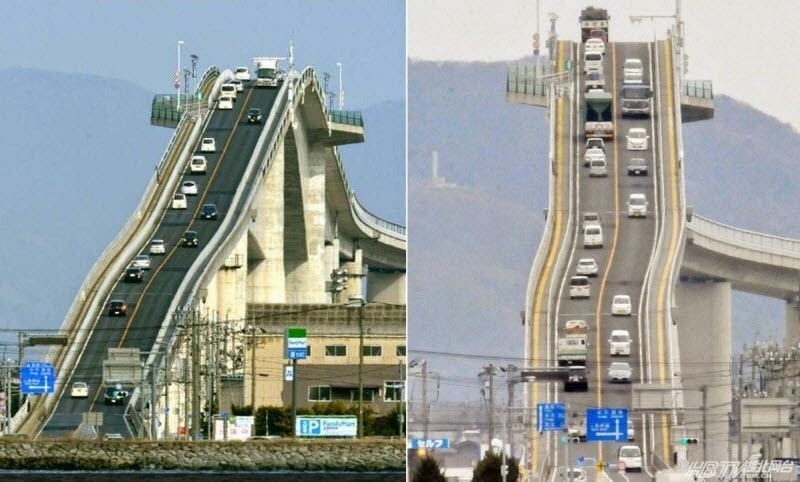 A 5.1% and 6.1% grade on each end of the Eshima Ohashi Bridge is enough to make you never want to drive across it looking at photos, but the media tends to focus on the optical illusion the bridge creates from being captured straight on. You can see in the featured image above how the bridge becomes less and less intimidating the more you move to either side of the bridge to take a picture. In fact, most compare driving on the bridge to simply driving down a hill so don’t let the drop off give you nightmares people! 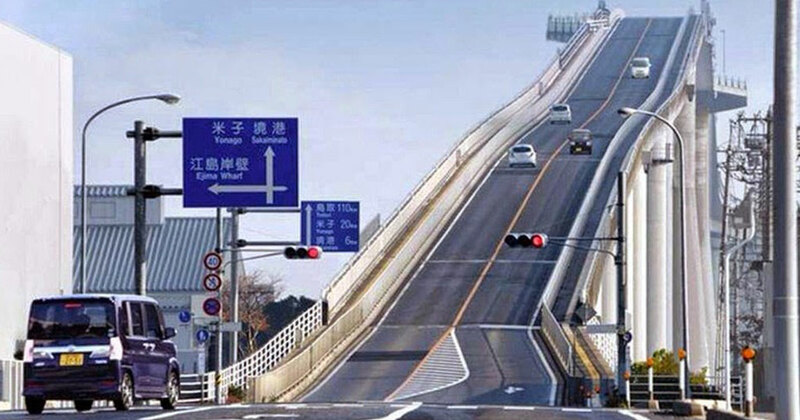 We’ve seen truly terrifying bridges before, but nothing quite as scary-looking as the Eshima Ohashi Bridge in Japan. 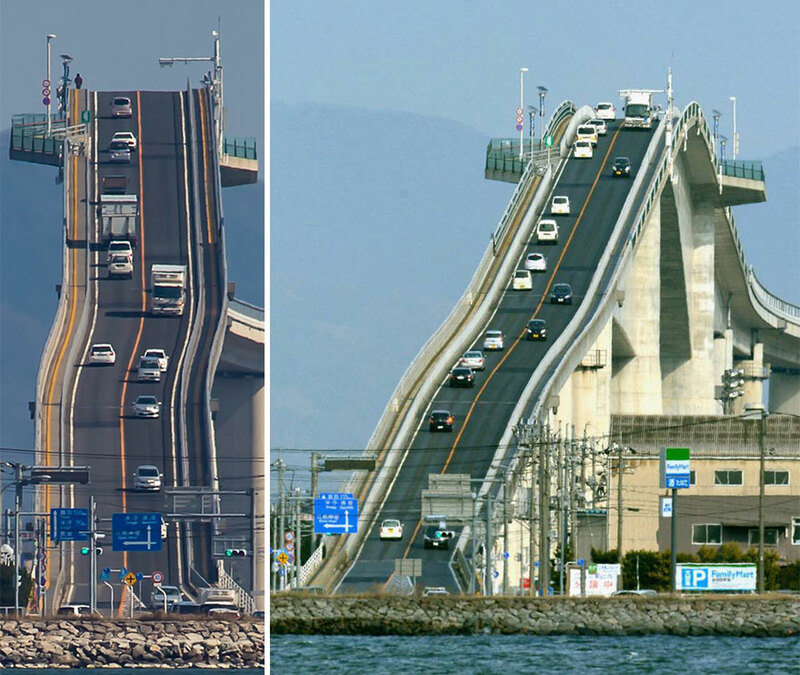 In pictures, Eshima Ohashi definitely earns its “roller coaster bridge” nickname. All we know is we’d hate to get in a traffic jam at the top. 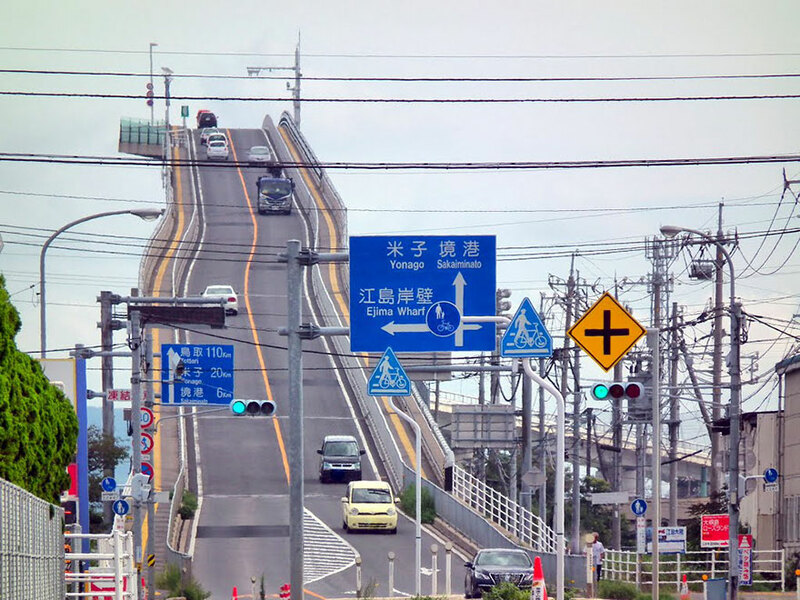 The Eshima Ohashi Bridge is a Japanese rigid frame bridge with an unusually high span that–from certain angles–makes the structure look like a roller coaster for cars. In reality, the 144-foot-tall bridge features grades no steeper than 6.1% (long lens photography exaggerates the incline). The bridge connects the cities of Matsue and Sakaiminato in Western Japan. The bridge’s high span is designed to accommodate boat traffic, as Sakaiminato is a major fishing port.